We have a map of 512×512 tiles where each pixel has a unique hex code. Dividing the map into 512 lines, each with 512 tiles. The line is 131 072×256 pixels in size, 33 554 432 pixels overall. All that’s left is to calculate how many square kilometers are made up by pixels in those lines. First, understanding where the Mercator projection put our lines on the sphere. Learning that on Google Maps data is shown in a spherical coordinate system (Spherical Mercator EPSG:900913 (EPSG:3857) and WGS84 Datum). The sphere radius is 6 378 137 meters. The map does not show the entire sphere, the maximum polar parallel is 85,051 128 78°. 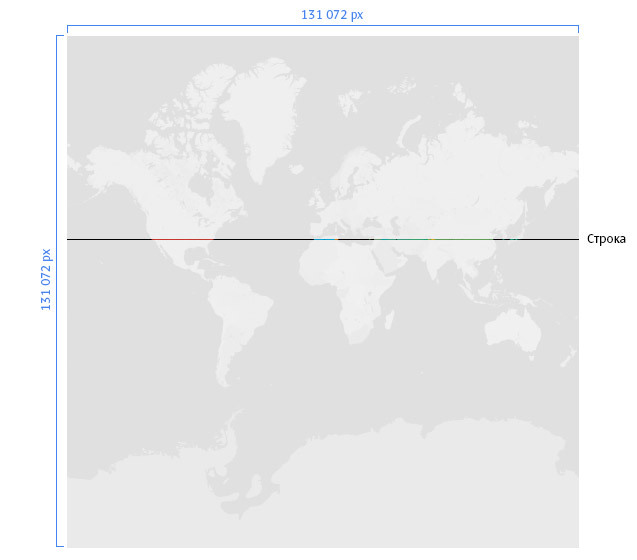 In the Mercator projection, the parallels are shifted the further they are from the central meridian. R=1; θ is the parallel angle in radians. 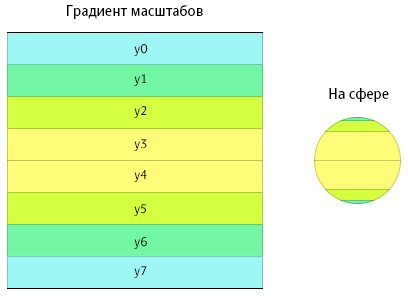 On a Mercator sphere the scale of map segments (tiles) is decreased gradually with distance from equator. 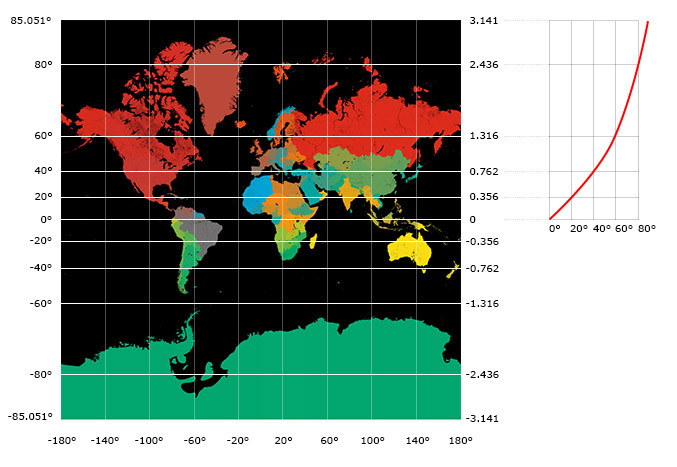 If we were to imagine the Mercator projection as a gradient scale, it would be absolutely linear. All lines on the scale are exactly the same, yet the closer the line to a pole on the map, the smaller its scale on the sphere. To determine the scale range, we convert the angle of the maximum polar parallel into radians 85,051 128 78° · π / 180° = 1,484 422 229 748 71 and calculate its scale coefficient using formula 1. Since the sphere is symmetrical, it is sufficient to determine the scale coefficient for each parallel for only half of the sphere, meaning to calculate angles for 256 lines that have the same size on the map and become smaller the further they are from the equator on the sphere. The scale gradient can be divided into any number of segments, but given the scale of the map we need exactly 256, from the equator (y255) to the polar parallel (y0). Dividing the scale gradient into 256 segments. And so on all the way to the polar parallel. Using formula 2, we can convert the scale coefficient for each parallel into radians and degrees. Calculating the area of the polar segment that didn’t fit on the map. All that’s left is to calculate the area of each line. Finding the angle (φ) of intersection of the parallel with the sphere radius in radians for each parallel from θ255 to θ0. Finally, we get the area (S) of each line. To get the area of a pixel in the line, we simply divide the line area by the number of pixels it has. Tiles in the Mercator projection in scale 10 on the sphere have a shape that looks oddly like a square. Using some magic to calculate the number of pixels. Looking at how many square kilometers are made by pixels in each line. Rounding the numbers and comparing with the data from Wikipedia. Recalling our story about Yemen and the housewife. Some territories didn’t make it on our list, including the Somali Republic, Jubaland, Galmudug, Puntland, Maakhir, Khatumo, Somaliland, Awdalland, Nagorno-Karabakh Republic, Lugansk and Donetsk People’s Republics.